Listen to the creek as you're soaking in the hot tub! The Trout House is a 4 bedroom, 3.5 bath, 2010 sq. ft. town-home that sleeps 8. 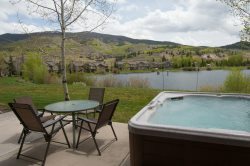 Features include a private outdoor hot tub, great views of the Blue River (right in the back yard) and mountains, beautiful furnishings, leather sofas, a nice deck, a gas fireplace in the main living area, and a 2 car garage.